Three months ago today I gave birth to my daughter Rowan at 40 weeks and one day. There was a cord problem and she never breathed on her own. As an avid crafter I have always wanted to Blog about my experiences. 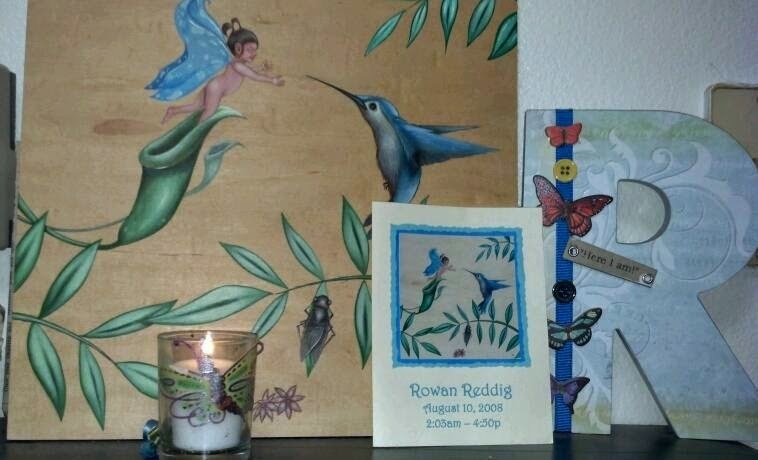 Since we lost Rowan I have been spending all my "unexpected free-time" working on various projects, and "artwork" with my 3 year old Griffin. I am the Admin. V.P. of the MOMS Club of Camas. It's my job to come up with service projects to give back to our community. They wanted a project that is personal to a member. When they wheeled me out of the NICU to choose a beautiful handmade blanket for Rowan, I knew what our next project should be. This week our members begin making crocheted (or knitted) blankets to donate to local NICUs, in memory of Rowan. I love sharing my passion for crochet with others and plan to teach anyone in our club who is willing. In the spring we plan to start making quilts, with the help of some of our sewing moms (check out one of our crafty moms at Sunshine Salad). In the hospital we were given a crocheted afghan and a handmade quilt. For parents in our situation, these blankets are the only things we have to take home and cuddle. This project gives me something positive to focus my time and energy on. I encourage everyone to make blankets (or hats, or whatever is needed) to donate to your local hospital. Other grouops have agreed to make blankets to donate, in memory of Rowan. I am excited to be a part of this! I'm sorry about your daughter, but know that there is at least one young crochet-crazy girl named Rowan out here!